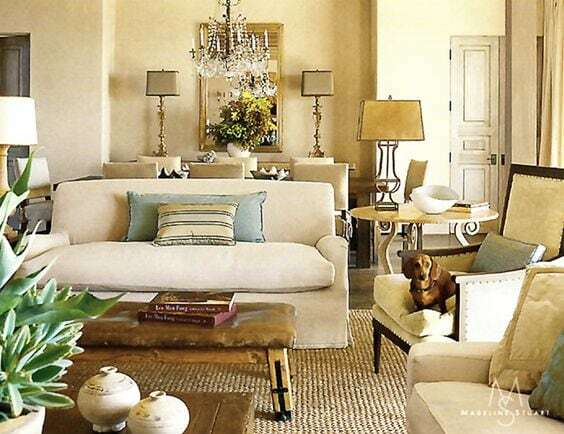 Now I’m going to touch on the fifth (and possibly, final) thing I think you need to give your house that collected look, and that is a “style mix.” In order to get the depth and character that you want here, you have to have a collection of different furniture styles and finishes. That means no dining room or bedroom “sets,” and that you should definitely not care if all the woods in the room are matching. In fact, it’s better if they don’t match. 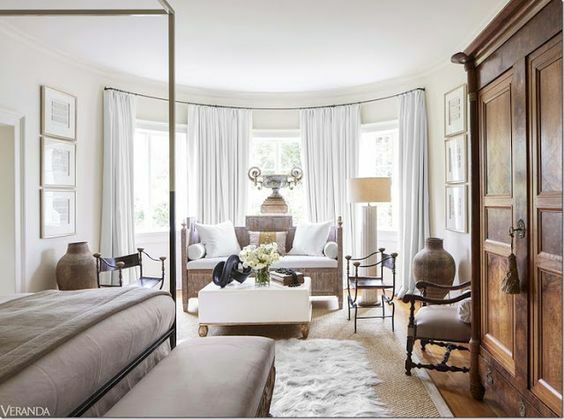 The best rooms, and probably most of the ones you admire in magazines, are a wonderful mix of eras, styles, and woods, creating a personal and eclectic space that is unique. And by it’s very nature, if you mix styles and finishes, it will look like you’ve acquired the pieces over time, something that buying a “set” could never achieve. Let’s look at some examples of a style mix…. 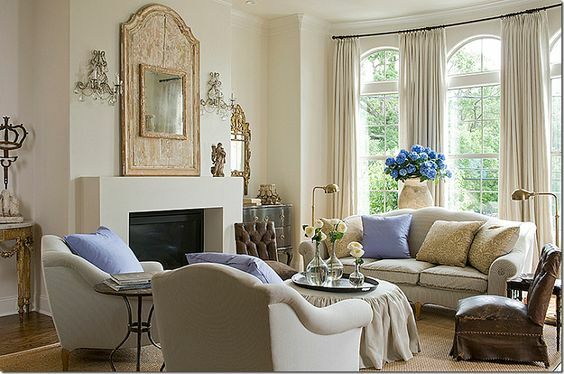 A favorite room! 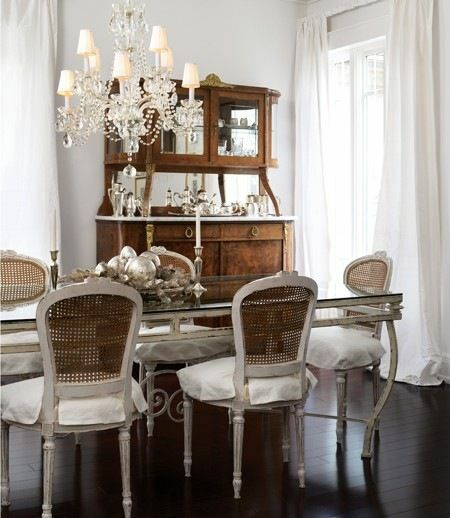 I see two different brown woods, gold and glass, and a gray wash on the chairs – but it all works beautifully together! Design by Billet-Collins. 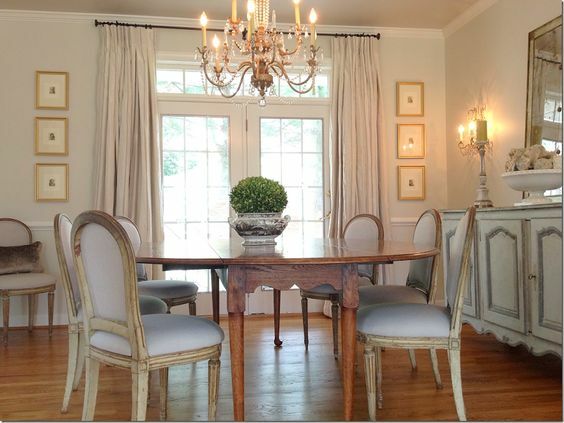 Dark and medium wood here, as well as painted white chairs and a grey table. Home of the artist John Monks. One of my all-time favorite rooms! Designer Donna Temple Brown’s spaces feel so collected and lived in, as if they’ve always been there. 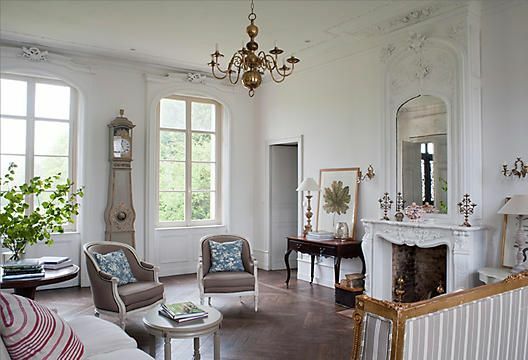 French and Swedish styles as well as different finishes all meld into one beautiful room. 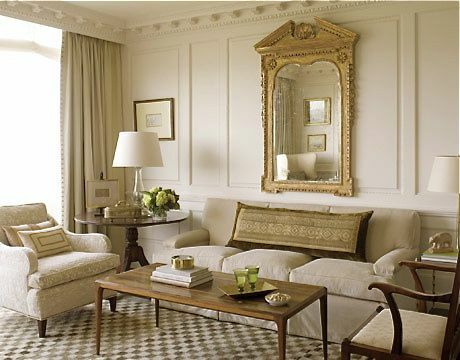 Love this contrast of the antique gold mirror with the clean modern lines of the coffee table and side chair. Via House Beautiful. This room seems so approachable to me! 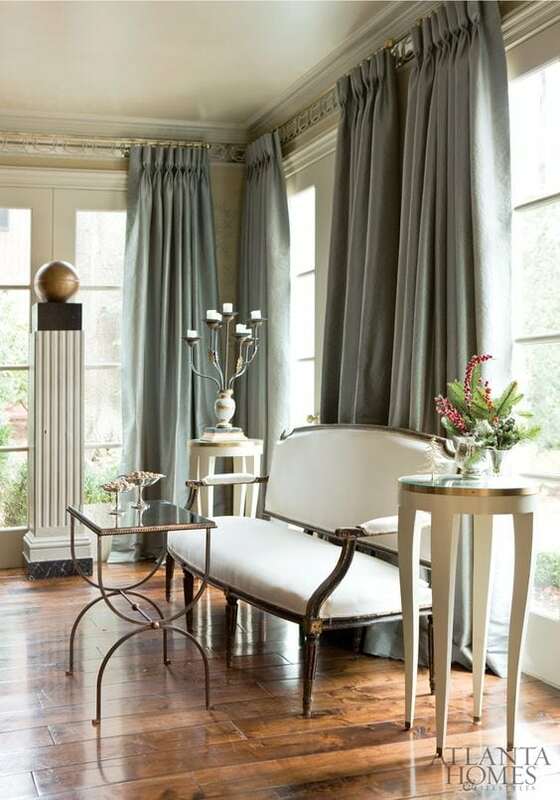 Couches are clean lined as is the modern console table, but then they have a dark brown wood traditional demilune table and an antique French barometer. Love, love, love this mix! Via Veranda magazine. There is literally every shade of furniture in this room! 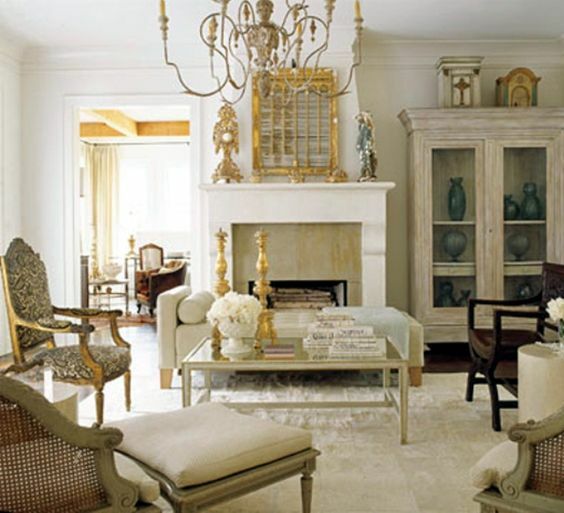 White painted surfaces, greys, dark woods, gilt chairs, as well as different styles and eras. Via House Beautiful. I’ve included this photo to illustrate my point about timelessness. 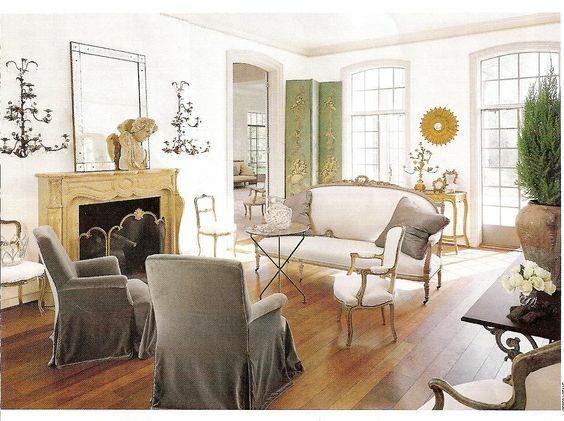 This room could be today, but it was designed in 1999! Would you ever have guessed that?! I love it, and I think it all still looks as good today as it did then. Designed by Babs Watkins. 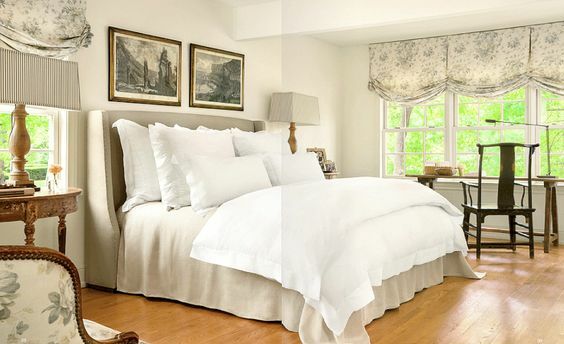 In bedrooms, it’s actually pretty easy to mix it up, as long as you don’t buy a matching set. Your nightstands can match, but then maybe your bed frame is different as is the dresser. Or, you can even do two different night stands which will automatically make for a more individual look. 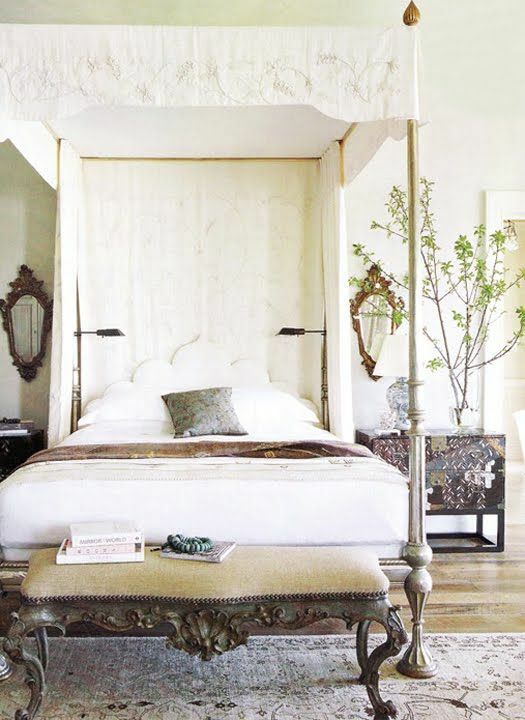 Here designer Tara Shaw uses two different night stands, as well as several different wood finishes and a very contemporary canopy bed. 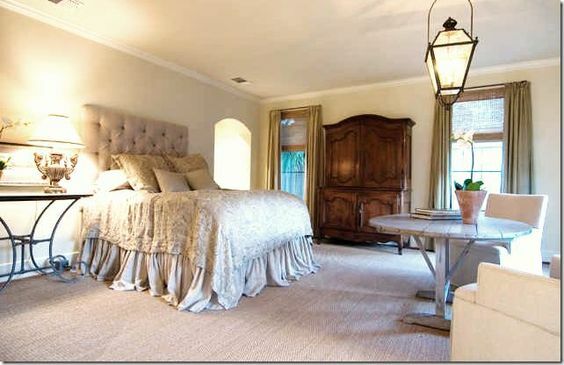 Two different night stands again, and both different than that gorgeous bed frame. By Suzanne Rheinstein. Very pretty! 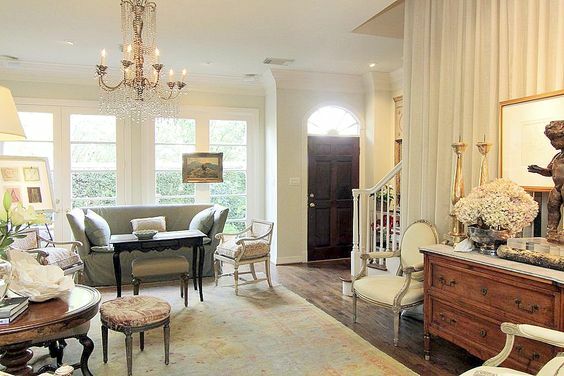 Luxe Living Interiors. 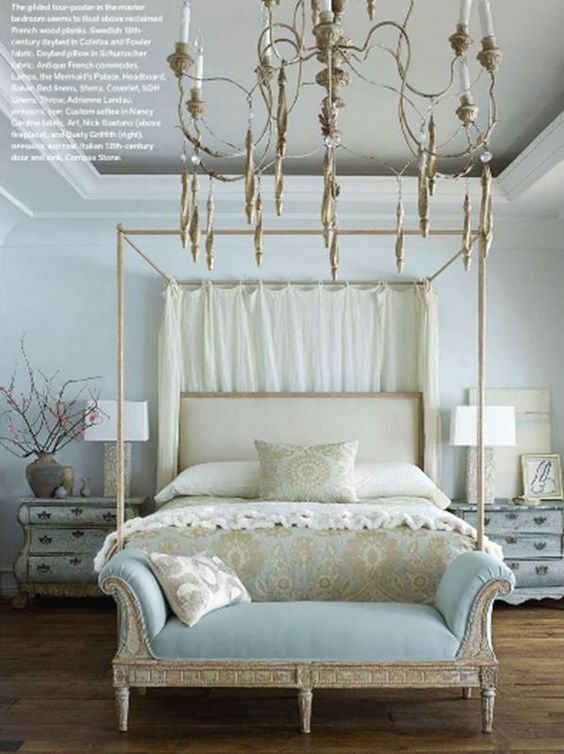 I’ve always loved this bedroom! An antique armoire mixed with a vintage painted wood wine table and a metal nightstand. And probably my favorite place to mix it up has to be the dining room. I guess because we all grew up with our parents matching dining “sets” it thrills me to no end to see the opposite of that now! I love a dark table with light chairs, or vice versa. And the buffet or sideboard can be the same as one of the table elements, or be a third different iteration altogether. 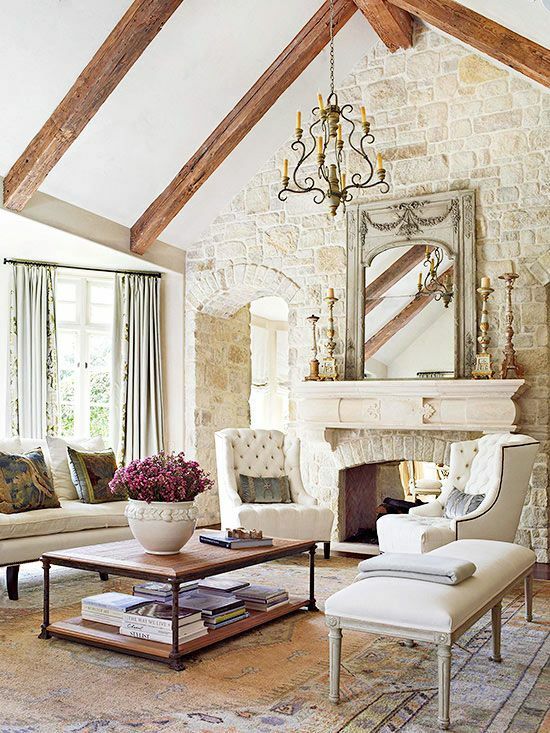 It’s so much more charming to see a combination of styles and finishes! Just stunning! Design by Tara Shaw. This is another image that is very old. I have an actual paper tear out of this from years ago (I’m not even sure of the date, but at least 10 years ago!) 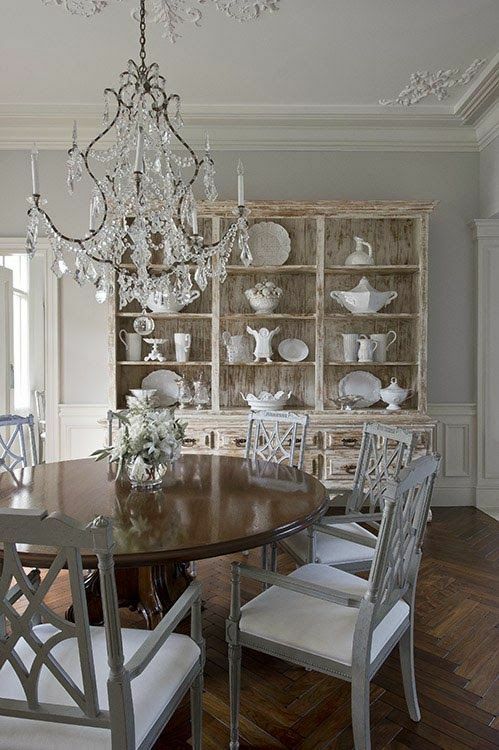 Love the mix of the white painted chairs, the burl wood buffet and that glass table. Via House and Home. Love light chairs with a dark table. Design by Loi Thai. 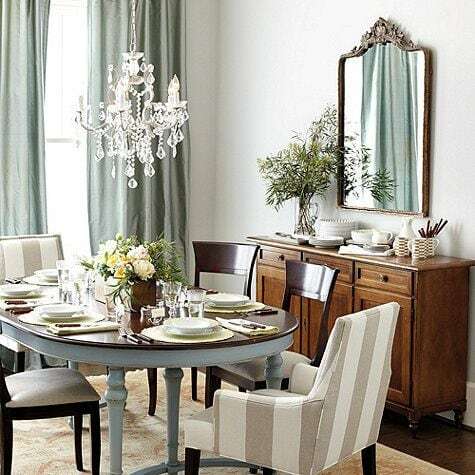 This dining room is so cute! 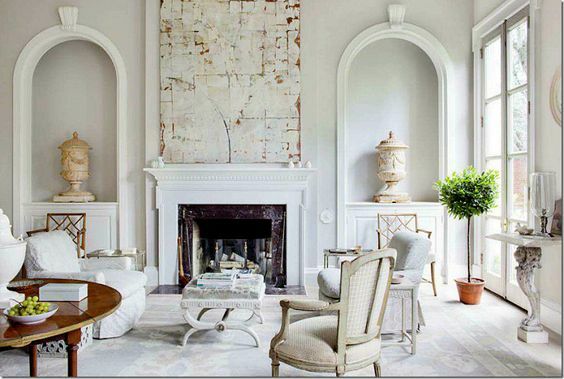 Love the mix of finishes in this room. From the blog Nubury Lane. 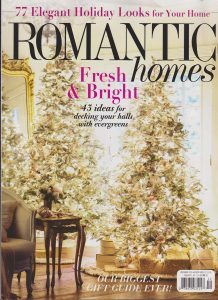 I hope that this series has helped you to see the amount of character and individuality you can add to your home, simply by executing a few of these tips. I really believe if you concentrate on making your house a reflection of you, and all of your uniqueness, that when it’s finished, not only will it truly reflect you, but you will be happier in the long run. The end result should feel timeless, like it’s an innate part of who you are. 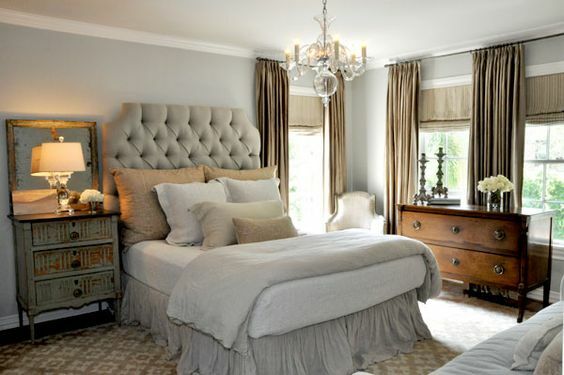 In fact, when you want to change things up or do some updating, you may find that your collections stay, your antique pieces just move to a different room, and all you have to do is add a few up-to-date pieces, maybe re-paint, and buy some new pillows and you will have a whole new room! But one that will still be representative of who you are. And isn’t that what we all want? Friday Favorites – Mad for Plaid! So glad to hear that it helped! I always hope to inspire and am so thankful for your visit and especially, for your comment! Thank you! Oh I'm so glad Anne! 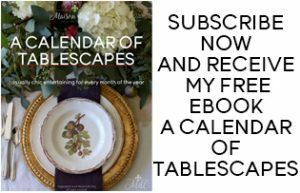 That's what I always hope to do with this blog – inspire you and help to give you ideas. I'm so glad that you decided to comment and share, I appreciate it so much! thank you – so glad you agree! It adds such character to a room, something you can't really get any other way. So glad you stopped by! What inspiration. I have been thinking of changing things around my house and this is just what I needed. Thank you. You've given me lots of ideas to ponder! I totally agree with your idea of a mixture of items in a room, I have always enjoyed some inherited antiques in different woods along with modern items we have bought, it keeps things fresh but also adds a degree of interest and a sense of time. Aww, thanks so much Eilis! So glad you liked it and that it's something you can incorporate into your own decor! 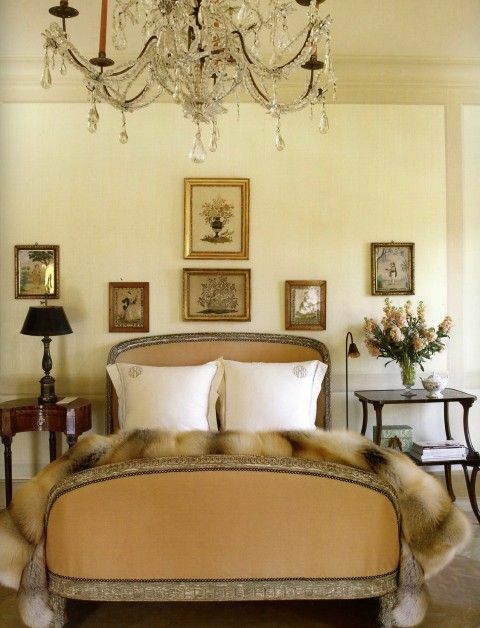 Wonderful rooms and great examples of a collected look. 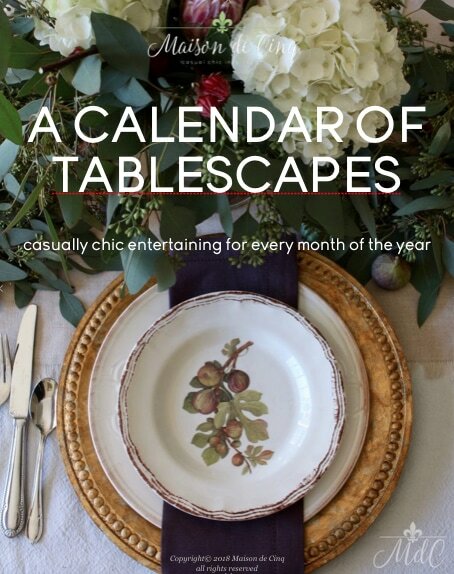 Your styling idea list is great and these photographs are just beautiful. I will be Pinning all of them!